The only surviving 8 sailed windmill in western Europe and probably the world's only one of this type. As the mill is still in operation, milling days are held where you can observe the stone ground flour being produced. You get to discover one of the finest examples of 19th century windmill technology. Originally built as a five-sailed windmill in 1830 by Edward Ingledew of Gainsborough for Michael Hare, the mill was worked for over 40 years by Sleighton and Joseph Nash until 1890, when a sudden tailwind destroyed the sails. New owner John Pocklington introduced the eight-blade fantail, with the mill driving five pairs of stones and a circular saw, used to cut elm boards for coffins. After Pocklington's death in 1943, all work at the mill ceased, with the County Council buying up the building in 1953. Extensive repair work was undertaken in 1969, with more restoration work taking place in 2004. The tarred five storey 16.8m high tower, tapers from 8.53m (the widest in Lincolnshire) to 3.35m in internal diameter, measuring 9.75m at the base. It was built in 1830 to plans by millwright Edward Ingeldew (who also built, among others, Wragby tower mill in 1831, Waltham Windmill in 1837, and the former Pickworth tower mill) for her first owner and founder Michael Hare of red brick, the outer walls being tarred (provided with a black bitumen paint in order to successfully keep moisture out), as a five-sailed windmill (very similar to Alford Windmill) with Sutton's single patent sails (15 feet tip-width and 12 feet heel-width) providing longitudinal shutters on both sides of the backs (36 feet in length). The mill has six storeys called "floors": ground floor, meal floor, stone (stage) floor, lower bin floor, upper bin floor (hoist floor), dust or cap floor. At that time the five-armed sail-cross drove three pairs of stones and milled grain for a 60 year period of time. But Mr Hare already died in 1834, and the mill handed over to Mr Sleighton Nash and then to Mr Joseph Nash who became its last miller before its defunction in 1890. A horrible tail-wind made the sails run backwards after the destruction of the fantail by lightning leaving the cap rotating uncontrolled, blew off the entire cap with the curb smashing it with parts of the upper gear and all the five sails to pieces, and destroyed the tower rim. Mr Nash had to abandoned the wrecked mill. In 1891 a Mr John Pocklington of Wyberton Mill had bought the eight-sailed mill cap with gear of the 78 year old defunct Tuxford's mill (built in 1813 at Skirbeck by the Tuxford millwright family as an example of their fine work) for just £72 at auction in Boston without any plans (N.B. the cost of a tower windmill was £2,000 in 1830). As a condition of the deal, he had to remove all the machinery from the mill site. So he was in an urgent need for a suitable mill stump to mount the cap on, as he had no place to put his new acquisition. 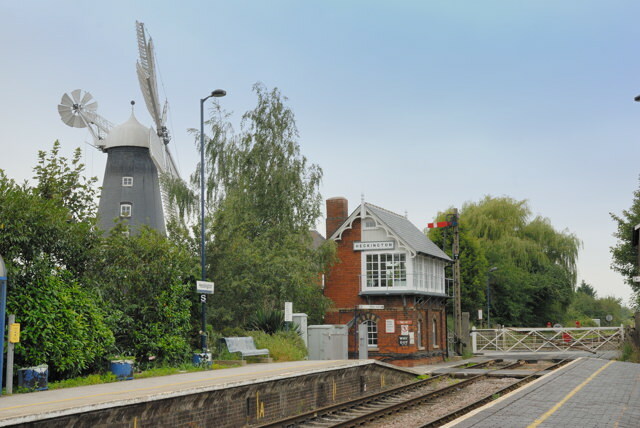 Luckily he came across the wrecked Heckington mill, bought it subsequently, and, from 1891 until early 1892, he fitted the white onion-shaped and fantail-driven Tuxford's Mill cap to the Heckington Mill and set it working for the following 54 years. Later on he installed a large circular saw-mill in a shed on one side, also driven by wind-power using line-shafts. It was used to make elm boards for coffins. John Pocklington was very successful in milling, baking, building, sawing, and farming. In that time and even up today the mill was also called the Pocklington's Mill. After John Pocklington's death in 1941 the mill stopped working in 1946 for the next 40 years. The shutters ("shades" in Lincs) were removed from the sails. In 1953 the mill came into the hands of the "Kesteven County Council" who made the first restorations preventing the fine old mill from being dismantled and restoring it as a rare landmark. Only four of the eight sails could be installed (from the Old Bolingbroke and Wainfleet St. Mary mills, ~ 22/25 miles north east of Heckington). When the mill changed hands to Lincolnshire County Council in 1986 the mill was finally restored to working order (the repairs included the construction of 192 new shades and four new sails sustained by the "Friends of Heckington Mill", with the new sails cross weighing five tons. The cap's overhang assures the fact it is from a mill with a much wider tower top. As a rare feature with post and smock mills (Dutch type mills) and common with "sail windmills" (with pole-shaped sailstocks and triangular sails) such as around the Mediterranean Sea) the sail-tips are linked together by steel rods or cables to prevent sagging in the sails, a probably unnecessary work with this kind of mill sails. Parts of the bigger timber wheels have iron teeth instead of wooden ones. Among the six floors the third one being the lower of the two bin floors provides two grain cleaners (a modern one driven by an electric motor and the other an old wind-driven separator. On the second floor, the stone and stage floor, there are the original three pairs of stones (two pairs of grey and one pair of French quartzite stones) and a drive down to the first floor with a fourth pair of stones. On the ground floor a fifth pair of stones was installed which could also be driven by wind if desired or rather by engine. The mill houses a mixer on the first floor and in addition an elevator from the ground floor. Due to its large sail area supplied by its eight sails and its well-winded site the mill is able to drive four pairs of millstones - now 2 pairs of French (quartzite) stones and 2 pairs of so called Peak stones (Derbyshire sandstone) and is able to work in very light breezes, when other local mills don't. An additional dresser is used to make white flour from time to time. 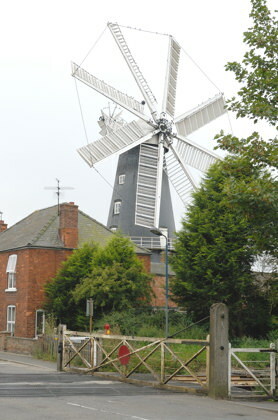 Now the distinctive eight-sails windmill is run by the Friends of Heckington Mill and was reopened in 1986. In 2004 the mill underwent its last larger restoration. Source of most information:- Wikipedia. Leach's tower mill in Wisbech, Cambridgeshire, the eight-storey now defunct tallest eight-sailer ever built. These mills were partly converted into four-sailed mills, into residences, were dismantled, or still exist as ruins. Mediterranean windmills ("sail-windmills") seem to have more sails, but their sails are in fact up to six long poles ('polestocks') forming a wheel-shaped sail-cross of 12 round sailstocks each holding one triangular sail. They don't have shutter-type or lattice-type sails (with canvas sails attached to the lattice blades) as they come with Dutch-type windmills the Heckington Windmill belongs to. Beside this there are a few post mills in Northern and Eastern Europe with six short paddle-shaped sails, and in Finland there're some eight-sailed hollow-post windmills with a similar type of short sails. These preserved 1859, Victorian station buildings house a collection of artefacts and historical information in connection with the local area. They also offer the opportunity to purchase a souvenir. Open Easter to September 12noon - 5pm Saturday, Sunday and Bank Holiday Monday. The attractive signal box is still staffed, with the signalman manually opening and closing the level crossing gates when required. Its still a request stop on the line from Grantham through Sleaford to Skegness, the old building was saved from British Rail's ever-eager demolition gang by the Heckington Village Trust in 1975. Off A17 Newark to Kings Lynn road. Follow brown signs from Heckington bypass. Situated opposite Heckington Railway Station on the road to Great and Little Hale in Heckington village. Signposted from A17. Easter to mid July, Thursday to Sunday & Bank Holidays, 12.00 - 17.00. Mid July to Mid September, daily 12.00 – 17.00. Mid September to October, Saturday & Sunday, 13.00 – 16.00. November to Easter, Sundays only, 13.00 - 16.00. Please let us know any other information that we can add to the Further information and Planning Grids or page and any errors that you discover. Before making a long trip to any location it is always wise to double check the current information, websites like magazines may be correct at the time the information is written, but things change and it is of course impossible to double check all entries on a regular basis. If you have any good photographs that you feel would improve the illustration of this page then please let us have copies. In referring to this page it is helpful if you quote the CIN Page Ref at the bottom of the Planning Grid above. To print the planning grid select it then right click and print the selected area.